What did the first dentures look like? Remember hearing about George Washington and his wooden choppers? Not his tools for cutting down cherry trees, but his false teeth. Actually, George’s teeth were made of ivory but were so stained that they appeared to be made out of wood. You might think those were the earliest dentures. In fact, the history of false teeth goes back centuries before President Washington. The earliest known dentures consisted of human or animal teeth tied together with wires. Examples of such dentures have been found in Egyptian and Mexican archeological sites. Other ancient peoples use carved stones and shells to replace lost teeth. These early dentures were probably made for cosmetic purposes. The materials they used were not likely to stand up to the pressure placed on teeth during eating. The earliest surviving set of complete dentures were actually made out of wood (sorry, George). They were found in Japan and date back to the 16th century. Human and animal teeth continued to be popular materials for dentures until the 20th century in some parts of the world. But the difficulty obtaining healthy teeth (and the risk of disease from unhealthy teeth) led dentists to search for other substances. In the 18th century, dentists began using porcelain, ivory, gold, silver and even rubber as tooth substitutes. 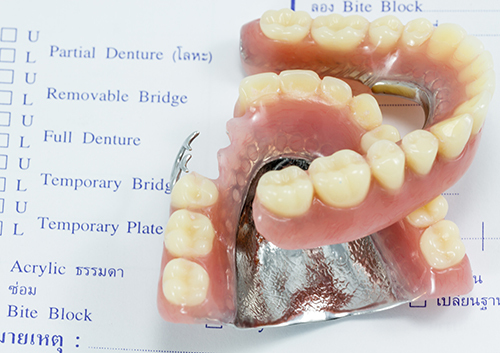 Dentures made with these substances could be used in eating. They were often ill-fitting, however, which may explain why George Washington looks puffy and glum in many portraits. Porcelain and metals were the most popular denture materials until about 1950, when plastics and resins were developed. Tough and durable, these materials make up most of the dentures Dr. Robert Klein and our team use today. Still, what goes around comes around. Researchers at the University of Texas are looking at using human teeth for dentures once again. Only in this case, the researchers hope to use biotechnology to spur the growth of new sets of teeth to replace those lost over a lifetime.